The Martin-Brower Company L.L.C., a distributor for the quick-serve industry, installed a computerized routing and scheduling system from Paragon Software Systems Inc. The software has enabled Martin-Brower to increase delivery frequency using its existing fleet without adding significant mileage. One of its service centers eliminated 5,000 miles a week on the road with the software, substantially lowering its operational costs. All 23 Martin-Brower distribution centers (DCs) in North America, Canada, and Puerto Rico use Paragon for the daily routing of multi-frequency deliveries to more than 6,000 customers. 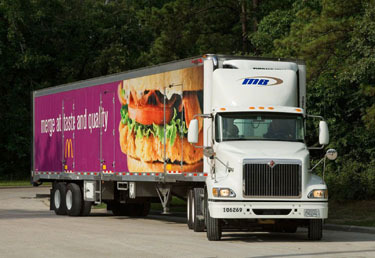 Martin-Brower supplies the individual restaurants with all their frozen and dry goods, packaging, cleaning products, and ancillaries using its 570-strong truck fleet. Chuck Gans, director of operations support for Martin-Brower, reports seeing benefits using the software reports. “When our Port Allen (Louisiana) DC changed from a two-deliveries-a-week schedule to a three-deliveries-a-week schedule, we constructed a new master schedule using the software, which enabled us to increase our weekly deliveries without adding excessive mileage. We expected an increase in miles, but the Paragon software allowed us to maximize our delivery routes without investing in new tractors and trailers. Paragon’s routing and scheduling optimization software was selected following thorough research to find an automated planning solution that can handle multi-frequency deliveries, maximize use of the existing truck and trailer fleet, and improve warehouse utilization. More than 20 vendors were reviewed initially. Martin-Brower selected Paragon because it offers a range of important features. Gans says the software includes several key features, including dispatch smoothing, allowing dispatches to be spread throughout the day utilizing the warehouse workforce properly. It also enables arrival time banding, ensuring locations with multiple delivery frequencies are all delivered within a user-defined number of minutes on all delivery days. This avoids some customers receiving morning deliveries on one route, and an afternoon or evening delivery on the next. “We also use Paragon’s delivery frequency planner to allocate store volumes across the schedules to make sure that specific orders are planned accordingly. In addition, the HTML reporting feature allows everyone to access important routing information produced by the software,” Gans says. The software also enables Martin-Brower to model new routes as additional sites are added. The software helps calculate which Martin-Brower DCs are best placed to serve the new restaurant. The software assists Martin-Brower in determining whether it can provide service with existing resources or if it needs to gear up with more staff and trucks. “I have worked with many vendors in my 20-year career in food distribution and Paragon has been one of the most supportive companies I have ever worked with. The company has always been quick to understand our needs for enhancements and our requests for training and support,” Gans says.